oil discharge from equipment in case of emergencies or equipment failures. Hydropower plants may store lubricating oils, transformer oils, and compressor oils on site. Turbine oils are used in turbine control systems that include oil pressure units, guide-vane servomotors, servomotors in runners, oil bearing, and thrust collars. Turbine oils are used under very extreme conditions such as high temperatures with air and mechanical impurities present. These unfavourable conditions result in the oil’s degradation. That means that the viscosity and acid number increases, the flash temperature is reduced, and mechanical impurities and sludge appear. 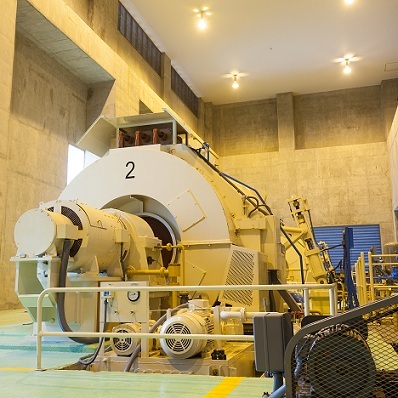 Hydropower plants perform regular monitoring of physical and chemical characteristics of turbine oils. Samples of turbine oil are taken and then analysed by well-trained staff in special chemical laboratories. If the oil’s characteristics are observed to have been degraded, then the oil is replaced with fresh oil. But, it requires great expense to buy new oil and dispose of the used oil. Additionally, waste turbine oil is a hazardous material and its discharge into the environment may cause contamination of soil and water systems. In most cases however, the degradation of the oil’s performance characteristics does not mean the end of oil’s service life. Reclamation of used turbine oil is a desirable way to reduce operating costs, improve the operational reliability of hydropower stations, and provide an uninterrupted energy supply. GlobeCore is one of the leading manufacturers of equipment for purification and reclamation of turbine oil, transformer oil, industrial oil, transmission fluid, and other types of oil. GlobeCore reclamation/regeneration (recycling) technologies are distinguished through mobility, eco-friendliness, and cost effectiveness. GlobeCore equipment ranges in capacity and allows a hydro power plant to choose the most optimal equipment to meet their needs. Used turbine oil reclamation, performed using GlobeCore equipment, improves the performance characteristics of oil allowing the reclaimed oil to be placed back into service again. It is therefore, very important to perform regular monitoring of oil’s condition to determine the degradation of its characteristics. Reclamation/regeneration of used oil at hydropower plants will reduce the need to install additional used oil storage tanks and will save fuel that is required to deliver used oil to collection centers or disposal sites. GlobeCore ensures a high-quality process in the reclamation of used turbine oil directly at hydropower plants. If you are looking for solutions that will reduce your operating costs, then GlobeCore technology is the answer to your oil related preventive maintenance problems.